One of the things I enjoy about my philatelic hobby is being able to come up with fun ideas for making tie-in covers, as well as selecting the stamps to go on those covers. For my covers bearing the Edgar Rice Burroughs stamp, issued Aug. 17, 2012, I wanted to see how many other stamps I could find to place on the envelope in addition to the ERB stamp, to tie into the subject matter on the cover design. An obvious one was the Geronimo stamp issued by the Postal Service several years ago, as a tie-in to a cover featuring images of ERB's two Apache novels. 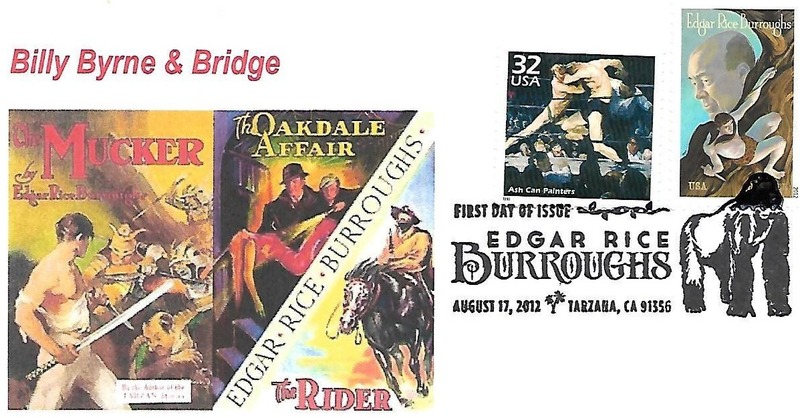 But what else besides that was ERB-oriented? Quite a bit, as it turned out. 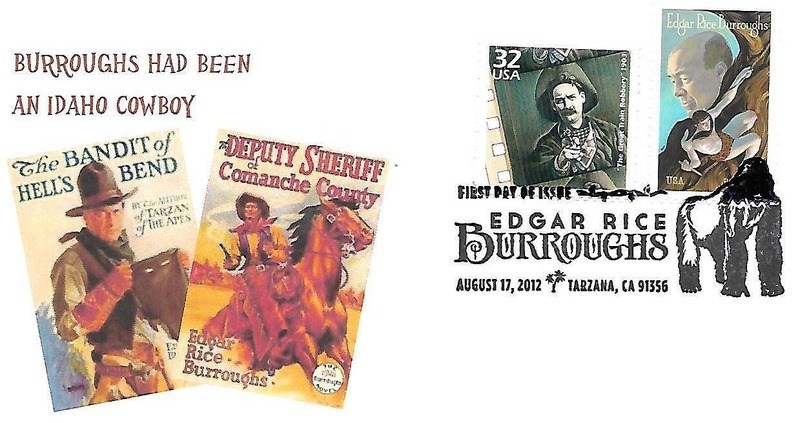 I went through my files of unused stamps and had a ball matching up older stamps with stories and themes covered by ERB in his many novels. In the past, I've displayed some of my Tarzan covers and a few Mars covers on facebook. 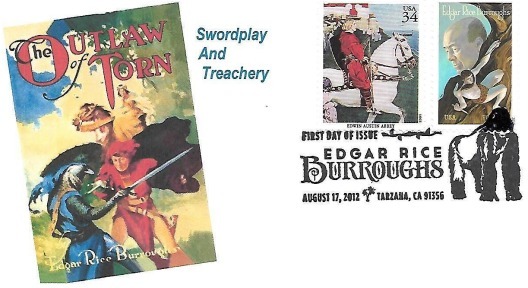 Here's a parade of covers from many of ERB's other books, featuring his stamp, plus stamps tied to the subject matter in one way or another. Note: Five sets were made of these covers. I have a set and two other sets are in the hands of ERB collectors. 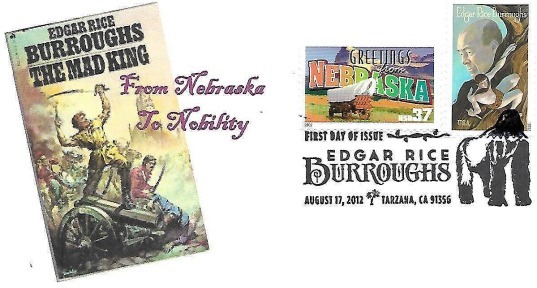 The two remaining sets, plus other ERB first-day covers, were put in albums and donated to the ERB Collection at the University of Louisville and the ERB section of the museum at Oak Park, Illinois, where fans can see them close up. although some of them warmed up to the human protagonists. This "Lion King" stamp is from the "Disney Friendship" stamp sheet issued in 2004. 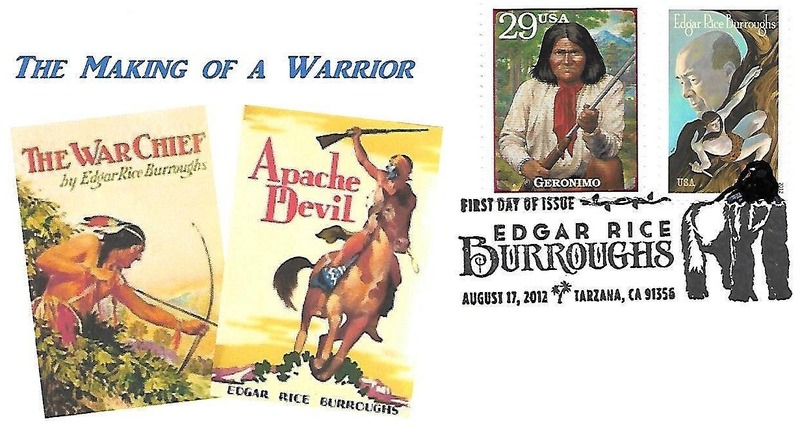 Geronimo was the first "ERB character" to be on a postage stamp. 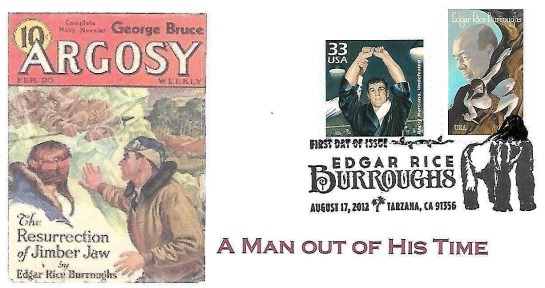 He plays a key role in ERB's Apache novels. 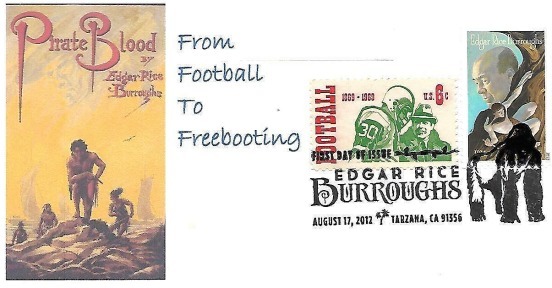 "Legends fo the West" sheet issued by the Postal Service in 1994.
commemorating events of the 1900s. The "Celebrate the Century" stamp sheet was issued in 1998. There were good guys and bad guys in ERB's two western novels as well. were in a 1992 booklet issued by the U.S. Postal Service. 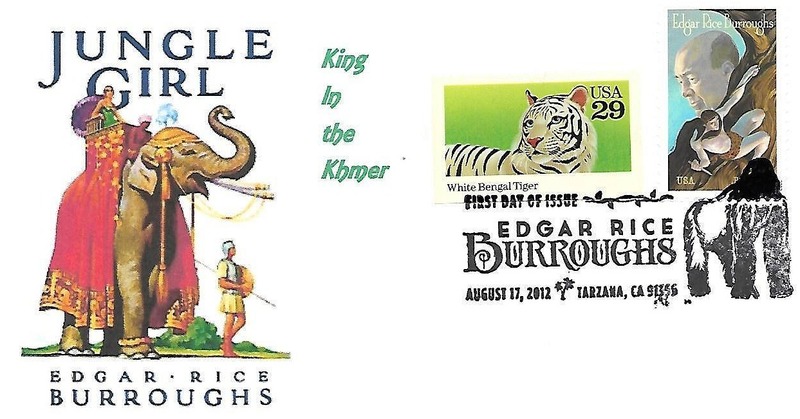 "My Lord, the Tiger" was a stalker in ERB's "Jungle Girl." included the Woolly Mammoth among its four subject. 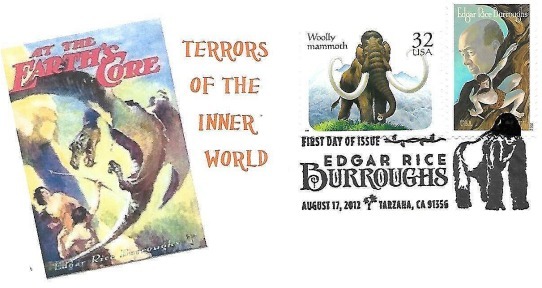 Woolly Mammoths also roamed Pellucidar, "At the Earth's Core." 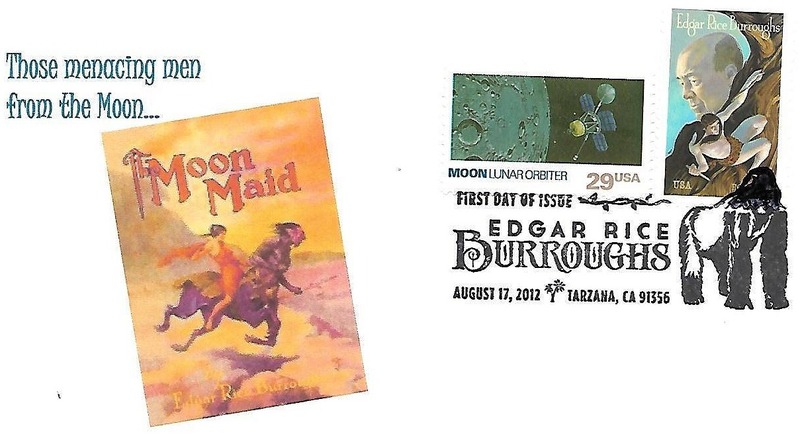 The stamp shows the surface of the moon. "The Moon Maid" took place inside the moon. 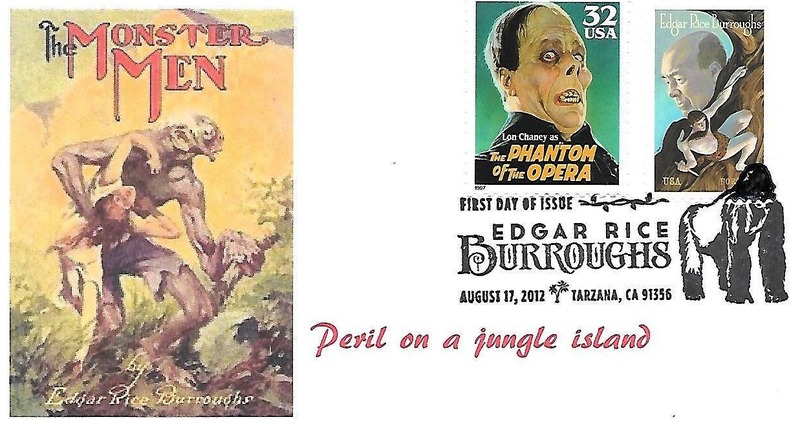 some of Professor Maxon's creations in ERB's "The Monster Men." issued by the Postal Service in 1997.
honors those who were uprooted, including Japanese Americans. 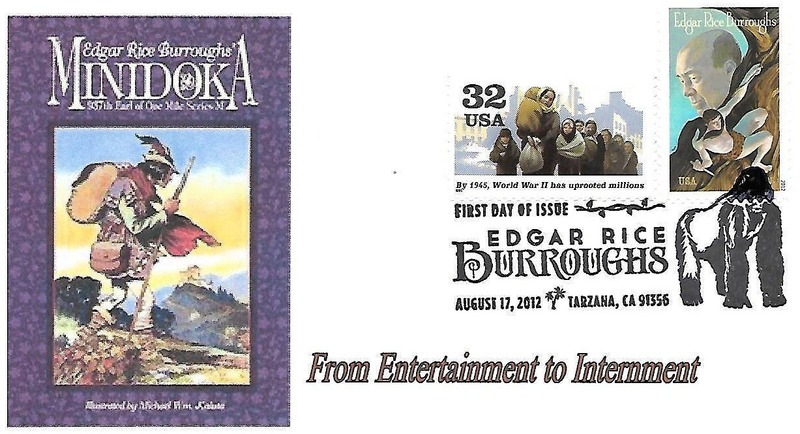 the namesake town for ERB's fantasy tale, "Minidoka,"
which has nothing at all to do with World War II or intern camps. were issued by the USPS in 2000. These images are right "out there" with the Farthest Star. to honor events of World War II on the 50th anniversary. "Forgotten Tales of Love and Murder," was actually an ocean liner. Johnny LaFitte played high school football before becoming a pirate. to honor the 100th anniversary of college football. who terrorized Rome as Emperor. Among his exploits was to declare war on the god, Neptune. where he was mistaken for "The Mad King." The events, of course, took place on Earth, so an Earth stamp works fine. 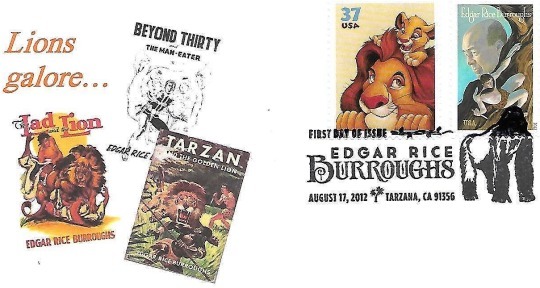 which is on the stamp sheet of American Illustrators issue in 2001. ERB's "The Outlaw of Torn," about medievel Britain. but boxing was one of the subjects, so the stamp ties in with "The Mucker,"
featuring Billy Byrne, who was a boxer, among other things. commemorating events of the 1990s. 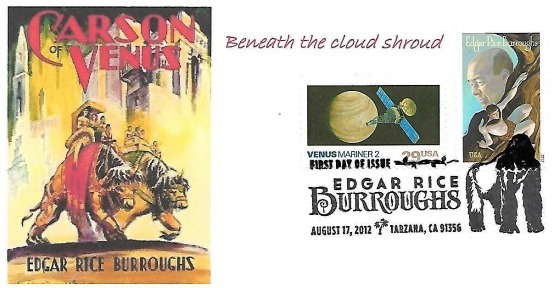 featuring pictures of planets that have been explored. 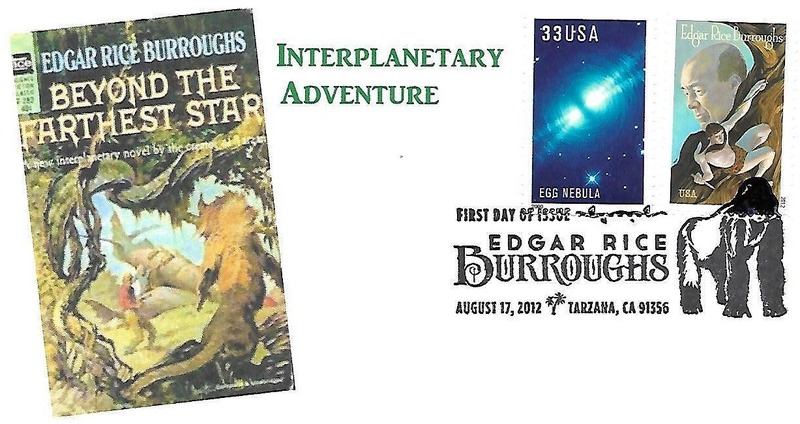 which noted that it was "Not Yet Explored." 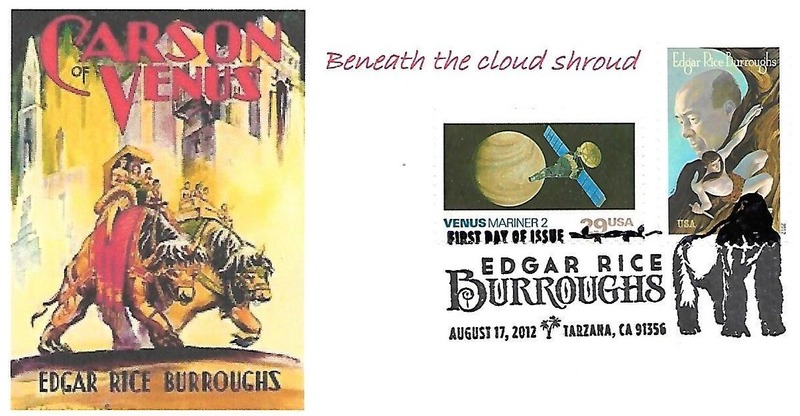 One of those stamps accompanied the New Horizons space probe of 2017. 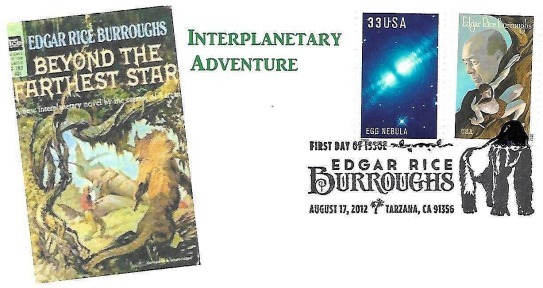 After that, the Post Office issued a new Pluto stamp called "Pluto Explored." via television, in addition to the movie theaters. Any movies made by ERB's "The Girl from Hollywood"
would have eventually shown up on the small screen. 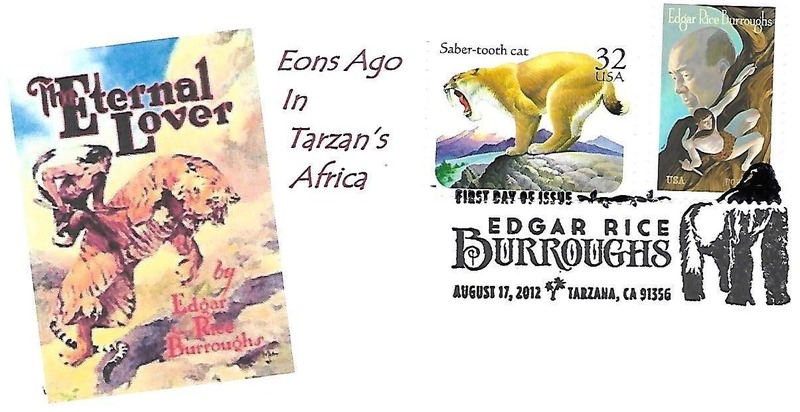 This beast was adversary to Nu, the son of Nu, in ERB's "The Eternal Lover." 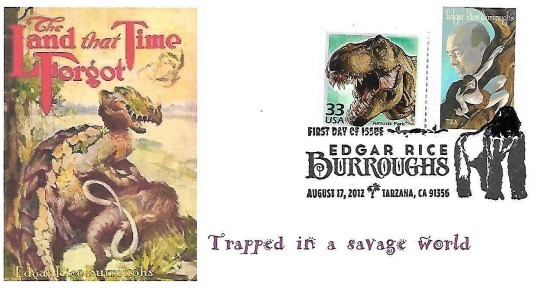 issued by the Postal Service in a 1996 Prehistoric Animals set. New York and Chicago were the settings for ERB's "The Efficiency Expert,"
"Greetings from America" sheet of 2002 adorns this cover. 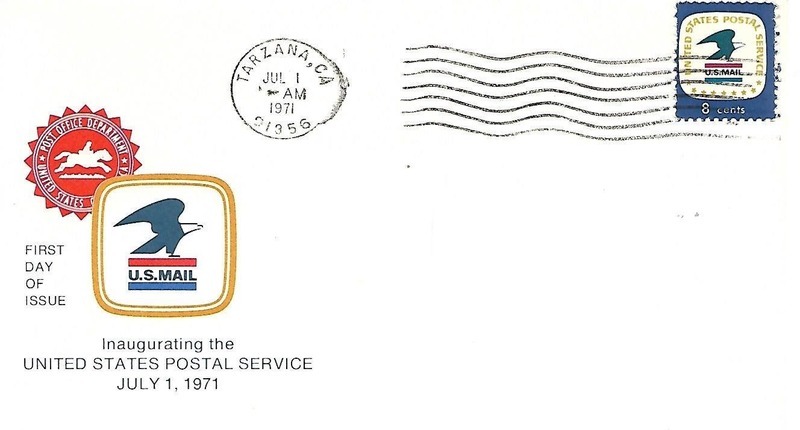 American Illustrators pane by the USPS IN 2001. 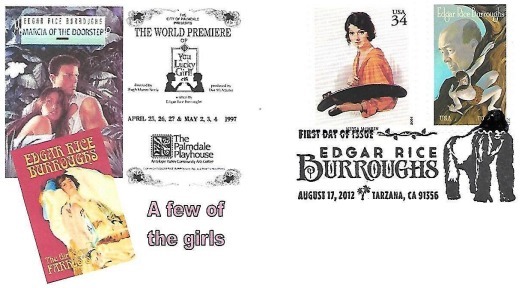 She's just one more of the "girls" to go along with some of ERB's "girls." 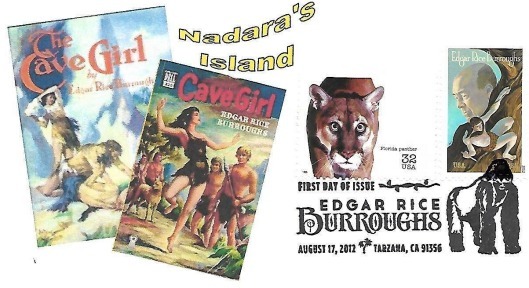 Nadara, ERB's "Cave Girl," was menaced by Nagoola, the black panther. 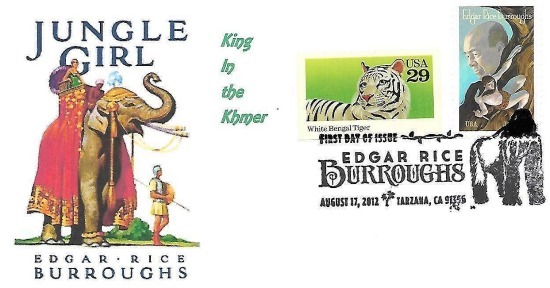 issued in 1996 to spotlight Endangered Species. who retired unfeated from the ring. 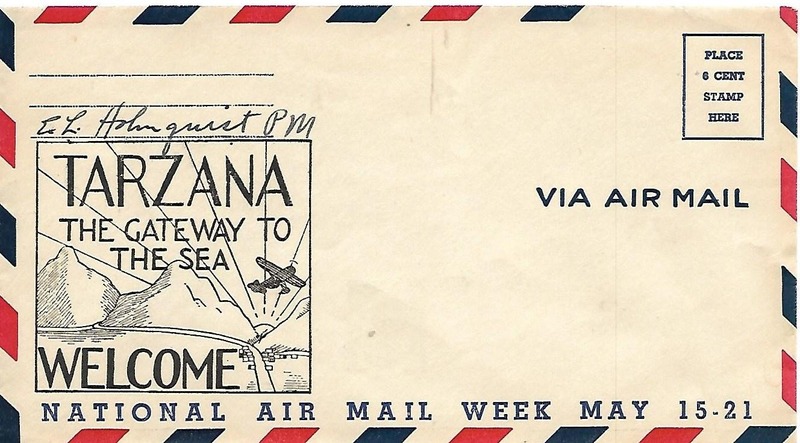 issued by the Postal service, celebrating the 1950s decade. 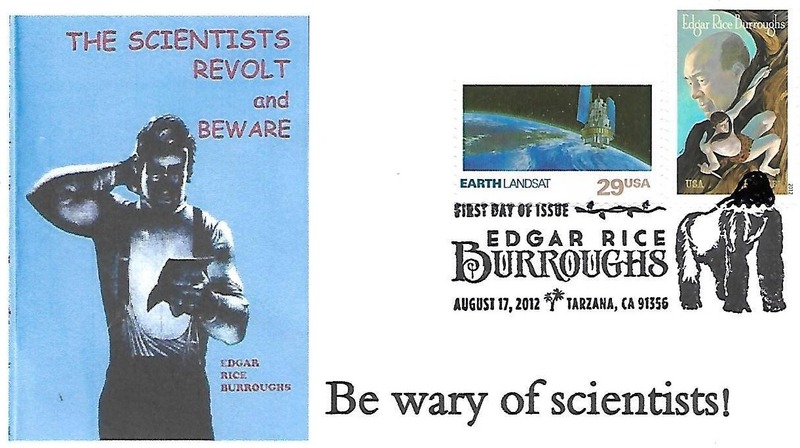 first-day-of-issue cancellation for the Edgar Rice Burroughs stamp. It also includes the personal postmark she used at that time. Darlene Altschul is a postal art enthusiast in the Greater L.A. area. She snapped this photo of the Tarzana Post Office in 2004.
the Art Cover Exchange. 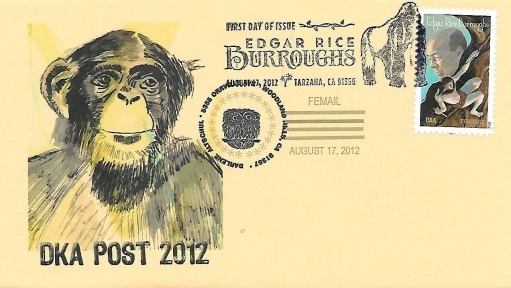 The postmark on this one is from nearby Thousand Oaks, Calif.
first-day cancellations were obtained at many post offices, including Tarzana. 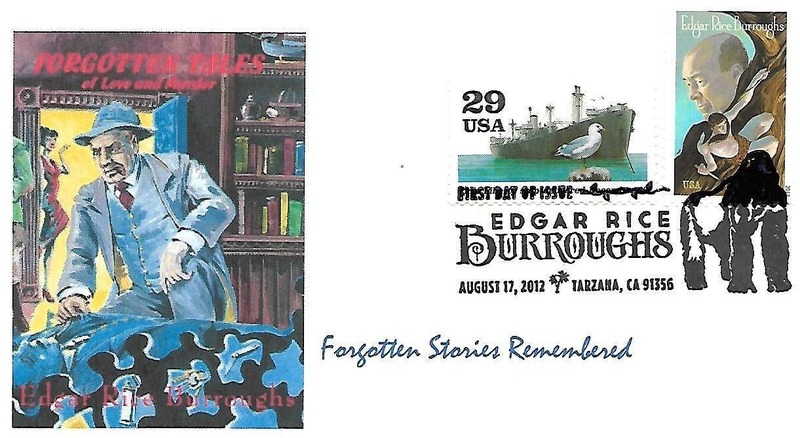 E. Louise Holmquist was Tarzana's first postmaster, when it was opened in a store on Dec. 12, 1930. 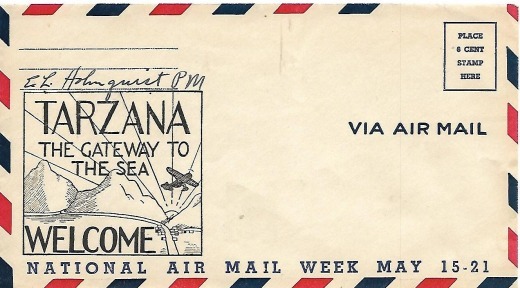 She signed a lot of Airmail envelopes which had a cachet advertising Tarzana as "The Gateway to the Sea." 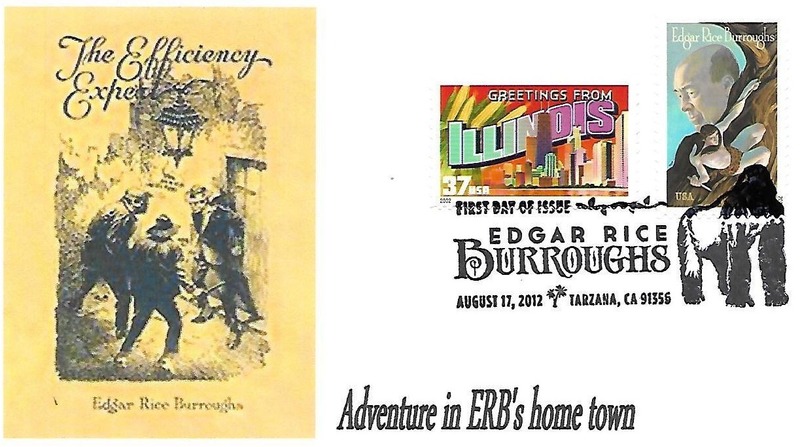 In his ERB biography, author Robert W. Fenton notes that ERB himself coined the slogan, which has yet to be fulfilled.